Recently, a colleague of mine tipped me off to a new sleeping aid for iOS. Well, not an aid exactly, but an app that measures your sleeping patterns, and analyzes the data to determine the best window of time for you to wake up. Called ‘Sleep Cycle‘, so far I’m having nothing but success, and good dreams. The way it works is actually quite simple. After you pop open the app and set the alarm time, you plug your iPhone in and set it display DOWN on the bed next to your pillow. What the app does from this position is use the built-in accelerometer to monitor your movement while you sleep. By monitoring your movement, it determines which ‘sleep phase’ you’re in… and in doing this, it picks the best time to wake you up, within a 30 minute window of the alarm time you initially set. So, you may be awoken up to 30 minutes BEFORE your set alarm time, but if you are, chances are you’ll feel rested and ready for the day. While it’s still early days in my testing of this app, so far each time the alarm has gone off I feel stunningly awake and rested-up. This is a huge change for me. Getting out of bed is usually quite an ordeal for me, and I’ll linger beneath the sheets for 10 or 20 minutes, half-awake, like a zombie while I gain consciousness. Now, I’m not sure if this is all in my head, or just dumb luck, but so far I’m digging the app. By analyzing my sleep patterns, it appears to be picking the best time to wake me up… I’ve never felt better getting out of bed in the morning. I encourage you to give it a try for yourself. 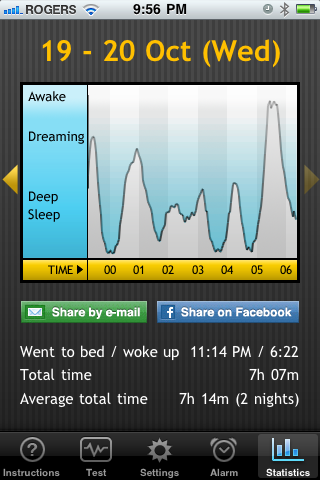 Sleep Cycle is available for only $0.99 in the app store. In my books, it’s a buck well spent.